Three years ago I stepped away from student ministry in a local church setting into my current position as the director of LifeWay Student Ministries. I had been a student pastor for 13 years and I was having the time of my life at an incredible church in Hampton, Virginia. It was one of those situations that you don’t just walk away from. Over the last couple of years many of my friends have also transitioned out of student ministry into other roles. Some are pastors, others church planters, associate pastors, next generation pastors, young adult pastors, you name it and they’ve transitioned into it. All of them were in healthy situations where they were making an impact, and have made healthy transitions to these other positions. This leads me to the question of the day. Not just today, but a question that has been asked of me many days throughout the last three years and a question that has been pondered frequently among those who have been in student ministry for a while. When is it time to step out of student ministry? I would like to admit up front that I don’t think there’s a concrete answer for this question. There’s no magic formula that you can use at the end of this blog to find out if you should step out of student ministry into another role. A current reality in student ministry is that we live in a day where the tenure of a student pastor seems short. I’m not referring to church switching here (different issue altogether), but the actual time that someone spends as a student pastor. It saddens me to think of how many “student pastors” are just using the student position as a catapult to something “greater.” Student ministry isn’t a stepping stone. If you are treating it as such, just go do what you’re really called to do. Back to our question: when is it time to step out of student ministry? I think the best way to answer this question is to give you some observations from my own experience, and the experiences of others that I’ve gleaned from countless conversations with people who have made healthy transitions out of student ministry. 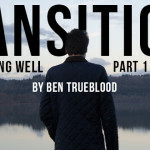 Observation 1: Healthy transition often comes when you aren’t seeking the transition on your own. Observation 2: There are seasons of growth, and there aren’t. Being in one of the non-growth seasons doesn’t mean that you’re washed up and should leave student ministry. It IS a time that you can use to evaluate process, strategy, and vision. Observation 3: Age isn’t a factor in this decision. Restructuring around where you are in life is always something to consider. For example, leading a student ministry when you have multiple children looks different than when it is just you or you and your spouse. Observation 4: There will always be people who disagree with you and these people shouldn’t determine God’s call on your life. Observation 5: Your response to authority says more about your own relationship with the Lord than it does about the leadership of your boss. Translation: leaving student ministry because of a bad relationship with your pastor is not the first option. There are many steps you can take before you get to that point. Observation 6: The work is always going to be hard, and there’s always going to be a lot of it. This is true because what you’re doing is meaningful and when you consider the end goal of reaching and discipling the next generation, we should work hard at it. Observation 7: As a student pastor you are serving in one of the most fertile mission fields on the planet. Observation 8: It is a tremendous honor to be a student pastor, to disciple students and their families, and to speak into a person’s life at its most critical stage. Observation 9: The grass isn’t greener over there, wherever “there” is. It’s just different. Observation 10: It is difficult to lead an effective student ministry when one foot is with students and the other foot is trying to find the next step. When is it time to step out of student ministry? In all honesty, I’m not really sure. 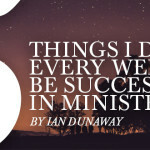 What I am sure about is that student ministry needs people who will stick around. Churches and families need student pastors who will give their focus and energy wholeheartedly to student ministry until the moment that God decides to move them. This is the way it happened with the friends I mentioned above. They were wholeheartedly devoted to student ministry until the moment God transitioned them, and even in the transition there was reluctance and a hesitance to walk away from something they loved so much. When is it time to step out of student ministry? At some level, it is time to step out when God calls you to something else, and you are hesitant, fearful, or remorseful (maybe all three) to step away from something that you love dearly.